RAW HOLLYWOOD : LADY GAGA TO MAKE TOUR ANNOUNCEMENT AFTER SUPER BOWL PERFORMANCE...? 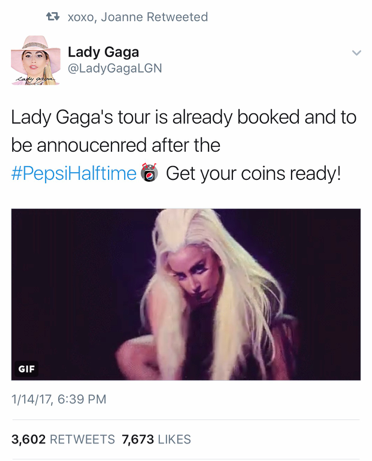 LADY GAGA TO MAKE TOUR ANNOUNCEMENT AFTER SUPER BOWL PERFORMANCE...? Every fans of Lady Gaga is anticipating her Super Bowl Halftime performance that is just 3 short weeks away. Sadly with the big games quickly approaching their hasn't been any promotion for the highly anticipated performance. Mother Monster continues to enjoy the success of her latest musical offerings of Joanne & has been working around the clock rehearsing for the NFL game. After a recent tweet many are speculating that she is planning a big surprise. A fan of Gaga tweeted that she will be making a huge announcement after the Super Bowl which is taking place on February 5th. While she did not directly make the announcement on social media she did retweet the fans tweet making many feel as though it's a confirmation.